Greencastle City Hall is located at 1 North Locust Street, Greencastle, IN 46135; phone: 765-653-3100. Photo: Richard M. Hazelett House, ca. 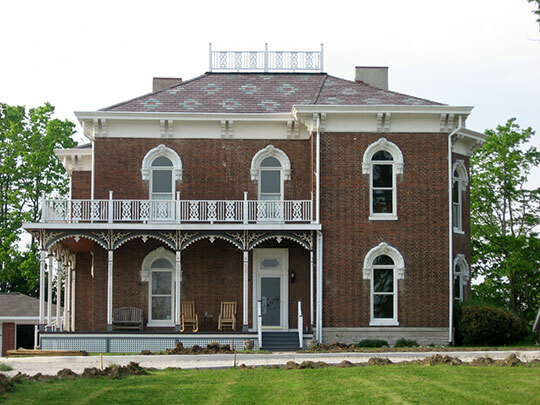 1868, 911 East Washington Street, Greencastle, IN. Listed on the National Register of Historic Places in 2006. Photographed by User:Nyttend (own work), 2011, [cc0-by-1.0 (creativecommons.org/publicdomain/zero/1.0/deed.en], via Wikimedia Commons, accessed December, 2013. Welcome to Greencastle, the county seat of Putnam County, Indiana. With a community population of 10,000 and a county population of 36,000, Greencastle is an ideal place for family living. Located in west central Indiana an hour west of Indianapolis and an hour east of Terre Haute, the community boasts excellent proximity to east-west routes U.S. 36, U.S. 40, and Interstate 70. U.S. 231, a Chicago to Miami route, is the main north-south route through the city. Rail service is provided by CSX. Seventy percent of the United States population is within a 1 day drive of Greencastle. Indiana is the 19th state, admitted to the Union in 1816. The first settlers arrived in this area shortly after and the land offices registered property owners. There was never any doubt that Greencastle would be the county seat of Putnam County, which was formed from Vigo and Owen Counties. The early courthouses faced north overlooking the beautiful Big Walnut river valley. Settlers found abundant forests, good water, and plenty of fish and game. Today the community has outstanding credentials: an All-American City, a Tree City, One of the Best 100 Small Towns in America, and the designation of it's downtown district on the National Register of Historic Places. DePauw University was founded in Greencastle in 1837 as Indiana Asbury University with an affiliation with the Methodist Church. The university was renamed in 1884 after benefactor Washington Charles DePauw, owner of the New Albany Glass Works in southern Indiana. Current student enrollment at DePauw stands at 2,200 with 12% international students representing 16 countries. The City earned it's reputation as a can-do community after IBM closed its World Parts Distribution Center in Greencastle in 1986, taking with it 985 jobs and a great percentage of the county income base. Those jobs have been replaced with some 3,500 other opportunities for work in manufacturing, distribution and transportation. The city is governed by an elected mayor and a five member city council. Various department superintendents and administrators are appointed. City Hall is located on U.S. 231 in the heart of the community. City of Greencastle Indiana, Comprehensive Plan, 2001, www.cityofgreencastle.com, accessed September, 2012.